The first organized indoor hockey game was played March 3, 1875 at Montreal’s Victoria Skating Rink, between two teams of nine players each, many of whom were McGill University students. The National Hockey League (NHL) was founded on November 22, 1917. The Montreal Canadiens have won the most Stanley Cups in league history, with 23. The most recent came in 1993. The diameter of a hockey puck is three inches. The fastest slapshot on record is Bobby Hull’s, which registered 118 miles per hour. Since 1914, the Stanley Cup has been awarded in every year but two. In 1919, it was not awarded after members of the Montreal Canadiens were stricken with sickness during the Spanish flu pandemic, and in 2005, it was not handed out after the season was cancelled due to a lockout/work stoppage. Darryl Sittler holds the NHL record for most points in a single game, with 10. He scored five goals and had five assists on February 6, 1976, helping his Toronto Maple Leafs defeat the Boston Bruins. The standard North American ice rink is 200 feet long and 85 feet wide. Wayne Gretzky holds 61 NHL records, the most by far of any player. The Stanley Cup has had many adventures since its creation in 1893. Through the years, it has been used as a cereal bowl, accidentally left by the side of the road, tossed into a swimming pool and even lost, like luggage, on a 2010 flight from New Jersey to Vancouver. It was later recovered by an Air Canada employee. The Hockey Hall of Fame is located in Toronto, Ontario. Phil Esposito of the Boston Bruins was the first NHL player to record 100 points in a season, in 1969. Before 1914, referees used to place the puck on the ice between the players’ sticks for faceoffs. This led to many cuts, bruises and even broken hands for the referees. Starting in 1914, the referees were allowed to drop the puck between the players’ sticks. Before games, hockey pucks are frozen to prevent them from bouncing during play. The last player in the NHL to play without a helmet was Craig MacTavish, who retired in 1997. Montreal Canadiens goaltender Jacques Plante is credited with being the creator of the modern goalie mask. He wore a face mask during a game on November 1, 1959. Clint Benedict also wore a leather mask for a few games in 1930. The NHL record for most goals in a game is owned by Joe Malone, who scored seven times for the Quebec Bulldogs against the Toronto St. Pats on January 31, 1920. The first hockey puck, used during outdoor pickup games in the 1800s, was reportedly made of frozen cow dung. A puck hit by the best shooters can travel at more than 100 mph. A goalie's chest protector is made of Kevlar, the same material used in bulletproof vest for police. 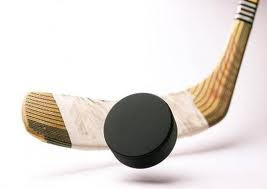 The puck is five ounces of solid vulcanized rubber, three inches in diameter and one inch thick. The puck is frozen before games to make it bounce resistant. The layer of ice in a pro hockey rink is usually three quarters of an inch thick and kept at a temperature of 16 degrees. The original Stanley Cup was only seven inches high. In the history of the National Hockey League, seven goalies have been credited with a total of nine goals. The NHL was formed in 1917 and has become one of the most successful professional sports leagues in the world. Regulation hockey nets are six feet wide and four feet tall. The Stanley Cup is named after a former Canadian Governor General, Lord Stanley of Preston, who donated the trophy in 1893. Maple Leaf Gardens — former home of the Toronto Maple Leafs — became the first arena to have a four-sided game clock, in 1932. In Detroit, fans often throw octopi on the ice during the playoffs, when the Red Wings score. The tradition dates back to the Original Six era, when it only took eight wins — one for every octopus tentacle — to capture the Stanley Cup. In 1992, goalie Manon Rhéaume became the first woman to play in the NHL, suiting up for the Tampa Bay Lightning during an exhibition game. Goalies cannot carry — or even touch — the puck on the opposite side of the centre line. The 1956 Montreal Canadiens team featured 12 future Hall of Famers. Paul Coffey of the Edmonton Oilers set an NHL record for defencemen with 37 points in the 1985 playoffs. The layer of ice in a pro hockey rink is usually three-quarters of an inch thick and is kept at a temperature of -9 degrees Celsius. The Anaheim Ducks — originally called the Anaheim Mighty Ducks — were named after the team in the Disney movie, The Mighty Ducks. In 1971, the Boston Bruins signed Bobby Orr to a five-year deal worth $200,000 per season —the first million dollar contract in NHL history. The first NHL goal was scored on December 19, 1917 by Dave Ritchie of the Montreal Wanderers against the Toronto Arenas. Former Philadelphia Flyers goalie Ron Hextall was the first goaltender to score a goal by shooting the puck into the other team’s net. Frank Zamboni invented the first self-propelled ice-clearing machine, in 1949. In the 1974 NHL Draft, Buffalo Sabres GM Punch Imlach decided to fool the media and league officials by drafting Taro Tsujimoto of the Japanese Hockey League’s Tokyo Katanas. Trouble was, neither Tsujimoto nor his team was real. The pick was later stricken from the records. Twelve women have their names engraved on the Stanley Cup, either as owners or team executives. The tradition of fans waving white towels during playoff games was started when then–Vancouver Canucks coach Roger Neilson waved a towel on the end of a stick at a referee during a game in 1982, as a cheeky sign that he was giving up after a number of questionable calls. Andy Brown was the last goaltender to play a game without a mask, doing so with the Pittsburgh Penguins in 1974. Prior to the 1927-28 season, forward passes were not allowed in hockey.